When Yeshua was calling Nathanael to follow him as one of his disciples, Yeshua told him, “Truly, truly, I say to you, you will see heaven opened, and the angels of God ascending and descending on the Son of Man” (John 1:51). Where did Yeshua get this imagery of the heavens opening and “the angels of God ascending and descending”? None other than our current Torah portion. But how is he able to make this bold claim angels will ascend and descend upon him? Although it is difficult to make the connection in English, when we read the Hebrew it becomes more apparent. In English it seems obvious what the angels are moving upon. It says the angels “were ascending and descending on it,” meaning the ladder. In the original Hebrew, however, non-gender pronouns such as “it” don’t exist. Like Spanish and most other languages, everything has a gender. So when the Torah says the angels went up and down “on it,” we can just as easily read it as “on him.” It is the same pronoun (bo) in Hebrew. Were the angels ascending and descending on it or on him? The Jewish answer to that question is, “Yes.” This is why Yeshua was able to allude back to this Torah portion to refer to himself as the one on whom the angels will ascend and descend. He is the stairway, or the gateway, between Heaven (God) and earth (man). The Midrash relates a teaching by Rabbi Aha in which he expounds on this passage saying that God told Jacob, “This gate will be opened for many righteous men like yourself” (B’reisheet Rabbah 69:7). He predicted a time would come in which many would pass through the gate and make the spiritual journey from earth to Heaven. Yeshua taught, “I am the door. If anyone enters by me, he will be saved and will go in and out and find pasture” (John 10:9). Through Yeshua the gate to God has been opened to the masses. 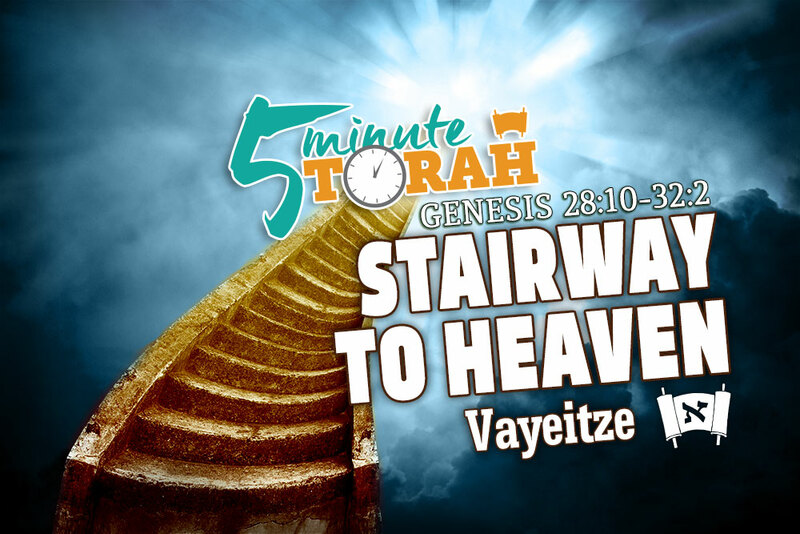 Through Yeshua a stairway to Heaven has been opened to all who will heed his call. Through Yeshua we can ascend with the angels to the presence of the Almighty and descend back down to earth, bringing with us a portion of the Divine in order to illuminate this dark world. When Yeshua walked this earth his disciples were able to see this angelic exchange. May we catch a glimpse of it in our day as well.